Is there someone in your life that zaps your energy, wears on your patience and pushes all the wrong buttons? These are "Reckless Relators" who will drag you into their own cycles of dysfunction if you let them. Let's identify them and learn how to break free from their toxic patterns. Here are 10 good reasons why you need to let go of the past pain and hurt and move on with your life. The most valuable asset we have is not our material possessions or trophies, but the people we love and those who love us. Let's work on building those relationships and maximizing their value. You sang the song and it inspired you with it's simplistic yet refreshing and frank advice. What do you do when you feel like giving up? Just keep swimming! It's just that simple. Is your family dysfunctional? Here's a better question, have you ever seen a family that wasn't dysfunctional? How do you deal with family drama? Here are a few tips to dealing with the drama. "If you don't have a plan for your life, you're living someone else's." I've learned so many lessons after 10 years of marriage. Here's 10 BIG ones! Have you ever met someone who had an infectious laugh, a wide smile, never hesitated to give an encouraging word and always spread positivity everywhere they went? It’s likely that that person has the spiritual gift of exhortation. Love Vs. The World is Xavier O'Connor's 2nd album. It illustrates the powerful story of the fight between good and evil. I'm gonna make this short and sweet. You need this album in your life! 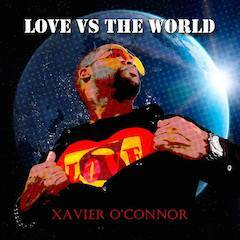 Xavier O'Connor is a gifted musician, singer and songwriter and in this his sophomore album Love Vs. the World we have a classic example of his artistic and creative ability. This guy is GOOD! Not only is it great music, but it's a power story of the battles that we fight everyday and the epic cosmic battle between good and evil that being waged over us. God is desperately fighting against Satan for our hearts and minds. Love battles over selfishness and hate. And in the end Love conquers all! In a few days we're gonna make the album available right here on thegrowthnetwork.org, but for now you can get it on Amazon, cdbaby, itunes, and more. Buy the Album, I guarantee you won't be disappointed. Abuse. Anger. Rebellion. Recklessness. But God can heal all hurts. Read Dee's story of God's healing and restoration. It is rue that God speaks to us in many different ways. God speaks through individuals, nature, providential events and more. However, could it be that God can also speak to us through sports? Read about it here. What happens after Easter? What is the appropriate way to celebrate after the novelty of the resurrection has worn off? Or do we just go back to business as usual?